It's New Year's Eve, the moon is full, and I'm starting to think about resolutions for 2010! Some I have already started on, having undertaken a healthy eating and exercise program in November. Already I am feeling so much better! There are so many things I want to manifest in the new year, including a renewed energy in my artwork. To me, there is nothing more blissful than spending several hours immersed in a project, unmindful of time going by. I truly love to create pictures and bits of needleart that bring a smile to a viewer's face. That is my bliss. I hope that the New Year is full of such moments for each and every person who reads this. 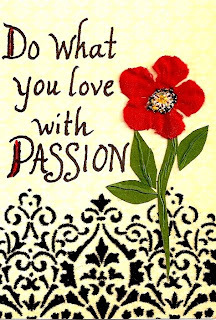 May you find real happiness in whatever it is that you love to do! Have a lovely and safe New Year's Eve! We have been in California for the last five days, spending Christmas with our extended family! The scenery is a far cry from New England's snowy landscape. I received some very thoughtful, crafty gifts for Christmas! Today the ladies of the family had a lovely brunch together, followed by a card-making party using Stampin Up products. Tracy demonstrated for us and brought some beautiful samples to inspire us! We managed to create quite a mess as we worked around the coffee table! And here we are with our creations! Back row, l to r: Teka, Barbara, Debbie, Ellie, Emilie, and Kate. Front row: Our hostess, Becca and me. Throughout the proceedings, Becca's dog, Abby, supervised and lent support!! It was such a lovely morning of friendship, laughter and creativity!! I wish every person who reads this post, old friend or new, a very happy holiday season! We've had a storm, everything is frosted, and the scene is set for Christmas! looks like winter around here! Today I completed and shipped the dog portrait I've been working on. A big sigh of relief always accompanies a completed order!! This is a beautiful Malamute and she is resting on some snow, so I decided to carry the blue-gray color into the border, with a white inner border. Stitching definitely lends itself to pet portraits!! This piece is entirely stitched by machine. Hope the owner likes it!! Here are three more cards created by Janice, also known as "Summer Girl", from Reyn's Nest. my blog is enjoying them. Right now I feel like I'm way behind on my "to do" list! For one thing, I owe Janice several ATCs! will photograph it in the morning and post about it. preparations to make for our trip next week, etc., etc. while buzzing around doing a million errands!! I have always loved to make tiny things, and enjoyed making these Christmas brooches a few years ago. The Christmas trees are 2" tall! Fun to make, especially the button snowman and black cat. After the holidays I plan to make some abstract, fiber art pins, using some of the textural fabrics and embellishments I've been collecting. For now, back to working on a custom order, with "A Charlie Brown Christmas" on the TV. Hope everyone is having a not-too-stressful, enjoyable week! This morning I went to a wearable art show in Gloucester, Massachusetts featuring work by a fiber arts friend, Diana Svahn. Diana does beautiful work dyeing silk and cotton fabric, stamping, foiling and sewing her creations into jackets, scarves and sachets. It was a lovely show with great fashions and jewelry, and I enjoyed going with friends and fellow fabric lovers, Barbara, Pam and SooKhim. Here is Diana with some of her silk jackets. 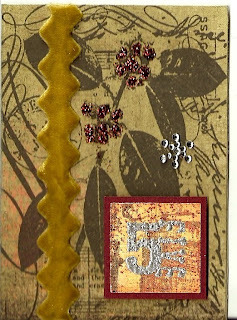 Here is an Artist Trading card made by my friend Janice, for this 12th day of December! I love the envelope with presents tucked inside! I'm working on a custom fabric portrait of a beautiful Malamute. I've just set it up and have much stitching to do! 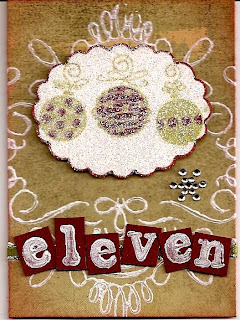 And here is an ATC by my friend Janice for the 11th day of December. Several readers have commented on what a good idea it is to do one for each day of Advent, and how wonderful Janice's work is. I agree! Last week at this time I was rushing to finish up some fabric artwork for our town's Holiday Stroll. My display was to go in the large window in an empty storefront next to a day spa. I had permission to arrange my display in any way I chose, and I discussed with the owner hanging a drapery in the window and pinning my wall hangings to it. The afternoon before the Stroll, I packed up everything and set out to hang my work. When I arrived, I couldn't believe my eyes when I saw all the windows painted with elves and snowmen!! The high school studentshad done this throughout the town and had painted "my" windows too! (through a miscommunication). Although I was disappointed, I went home, sewed loops on the top corners of my pieces, bought suction cups and came back the next morning with my daughter and we hung my work amidst the frolicking elves!! I love the way the snowman is looking at my picture of the snow scene with the little boy! "Carmelina" is looking down on a little elf! This poor elf is the victim of condensation dripping down the window! My floral hanging wasn't affected. Things don't always turn out the way we expect them to, but there can be laughs in being flexible! 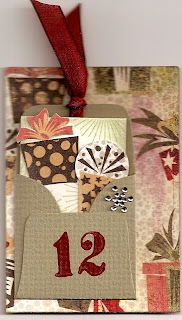 Here are my friend Janice's Advent ATCs for December 8, 9 and 10. Click on the photo to view them close up. I love every one of them!! Yesterday we woke up to a very pretty snowfall. I love it when all the tree limbs are frosted with snow! Our porch, which has windows on three sides, was surrounded by frosty trees. 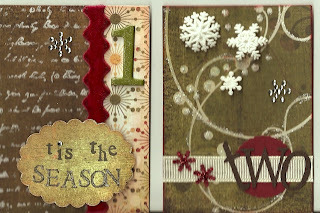 Meanwhile, here are my friend Janice's Advent ATCs for yesterday and today. Each one is so distinctive, while the whole collection is so harmonious in color and design. I just love them! I finally finished this fabric picture, and I named the lady Carmelina, after my paternal grandmother who came over to this country from Italy in the early 1900's. It is made almost entirely from fabric painted with transparent Setacolor paints, then stitched by machine. This picture was part of my display at the Holiday Stroll put on by my hometown today. Despite the blustery weather and a bit of rain, there was a good turnout and it was wonderful to see local artists coming together to show their work. There were performing artists, dancers and terrific band groups from our local high school. Businesses along the main street gave out hot cider and treats for passersby. A group of artists displayed work in a temporary gallery, a space lent to us by a generous landlord with an unrented store. We painted the walls, which were then hung with beautiful paintings and quilts. My fabric pieces were hung in the window of a restaurant attached to a wonderful salon and spa, and other artists were likewise represented in other shop windows. A great day, and I hope it will become an annual event! 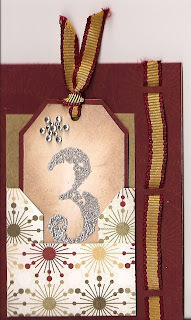 Here is the 5th card in the Advent series by my friend Janice. Beautiful! 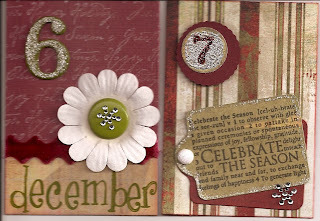 December 4 and another ATC from my friend Janice. As always - beautifully detailed, stamped and accented. What a treasure! I finally have some work of my own, photographed and ready to put on my blog - hopefully tomorrow! 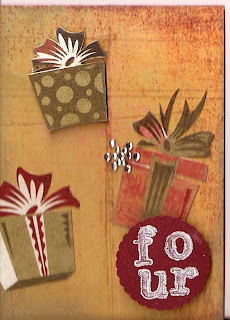 Here is my friend Janice's ATC for December 3rd! I love the little pocket for the number 3! Every card Janice makes has different techniques, and they all look fabulous together in my album! I wish I could say that I made these ATCs, but the artist is my friend Janice from Reyn's Nest, who is making a series of Artist Trading cards for Advent - 25 cards leading up to Christmas, and an extra set for me!! I am so lucky!! These are for the first two days and I will post one each day as the month goes on. Thank you, thank you, Janice! I am still in the process of preparing work for my exhibit on Saturday, and also trying to winterize my blog header, but not having much luck with it tonight! Hopefully I'll do better in the morning and will have a new photo behind the title. I cannot remember how I did it on my other blog. Any tips from my blogger friends?